The professionals at Green Island Design have a strong interest in educating clients as to our process and the standards we live up to everyday. Landscape design and construction on Long Island is a broad and diverse field. There are many companies to choose from and each has their own methods for design, construction, pricing, budgeting, and coordinating. There’s many pitfalls homeowners must look out for when making the decision to transform their home. The more we can do to educate and protect our clients, the better off they will be; as well as contributing to the elevation of the industry as a whole. Confidence in selecting your landscape design-build professional is essential in bringing your potential project to fruition. Your home is the most important place on Earth, and you should completely trust the company you select to handle your investment. How does Green Island Design instill that confidence in our clients? Each phase of the design-build process is a seamless transition. 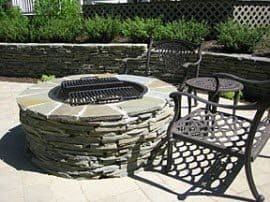 Your landscape designer has an intimate knowledge not only of design concepts and techniques, but construction methods and building codes. All potential design concepts are researched and planned based off of build-able and sustainable methods. Once construction is set to begin, our own skilled craftsman work directly with the plans and concepts created by our own landscape designer, who is directly involved in the build process on a daily basis. We build all projects “in house” from pool construction to all aspects of masonry construction — to the finishing touches of planting and landscape lighting. One company… one concept… one final product. Click here for a detailed summary of our Landscape Design process. From the professional design staff to the management team to the skilled craftsman building your project, Green Island Design employs individuals who possess the education and experience necessary for your project. Our highly trained staff uses the top quality products and revolutionary construction techniques to produce our projects. We also possess the necessary up-to-date licensing required in the ever-changing construction environment on Long Island. Click here for a detailed summary of our Landscape Construction process. Successful projects must be professionally coordinated regardless of how skilled the craftsman may be. Each phase of your project is interrelated and construction must move forward with preparations in place for those additional phases. Hiring separate contractors who are working independently from each other will create job site confusion, mistakes and overlooked essential elements, and most importantly: financial overruns. We avoid this by building your project with our own employees, while a Green Island Design Project Manager oversees the construction and coordinates all of the various tradesmen involved. This means you can go to your own job feeling secure that the construction and your investment are being managed with the utmost care and professionalism. From the moment you call our office to discuss your initial design consultation, the key to a successful project has begun. Communication between our clients and our staff is essential in creating the confidence and personal relationships these types of projects require. We explain each phase of the project in-depth, sequence the events and timeline of the construction, as well as provide consistent updates as construction moves forward. All staff members from the office staff, to the designers, to the skilled craftsman are there for you and your project. This communication and availability translates into fun and exciting projects, as well as long-lasting relationships. As any homeowner knows, there’s a lot to look out for when dealing with any type of home improvement. We strive to take the ‘guess work’ out of the already complex process of transforming your property. Our designs and proposals are a comprehensive breakdown of your entire project. Instead of the vague proposal or “free estimate,” we provide you with a complete itemization of all elements included in your potential project. Each portion of the project is priced separately with a full explanation of how it will be built, as well as the materials used and construction methods involved. This allows us to discuss every aspect of the project with the homeowner and together decide what is in their best interest moving forward. For our team, this isn’t just a job, but a lifestyle. The enthusiasm you will find from our organization is real. This comes from individuals who have been in this business for many years and appreciate the process involved in taking a blank canvas and creating someone’s dreams. Every single day is different and every single project is a new and exciting challenge. The people we meet along the way become a part of the Green Island Design family forever. There is a profound bond that comes along with working with people on their home. The journey from our initial meeting, to creating someone’s vision on paper, to actually building that dream and seeing it become a reality, is what we live for. That is the passion Green Island Design brings to you and your home with our landscape design and construction.